"Hello sir, Thanx again for all your help with the vest and the shorts...i have been working out with them pretty frequently and love them! 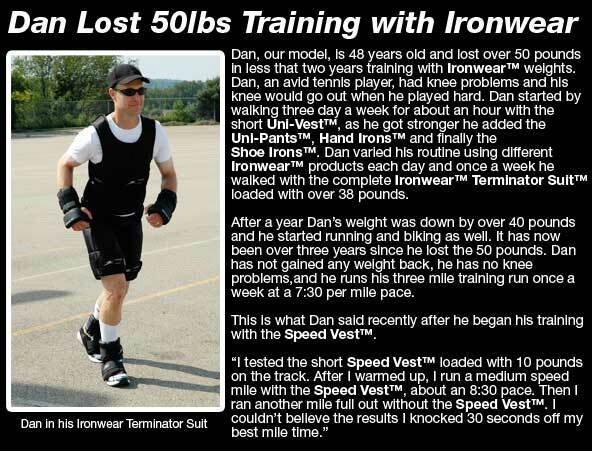 SPEED SUIT™ (long) Complete is IRONWEAR’s ™ top of the line athletic performance suit and includes IRONWEAR’s ™ revolutionary patented SPEED VEST™ (long), SPEED PANTS™, and brand new SPEED SHOE IRONS™. 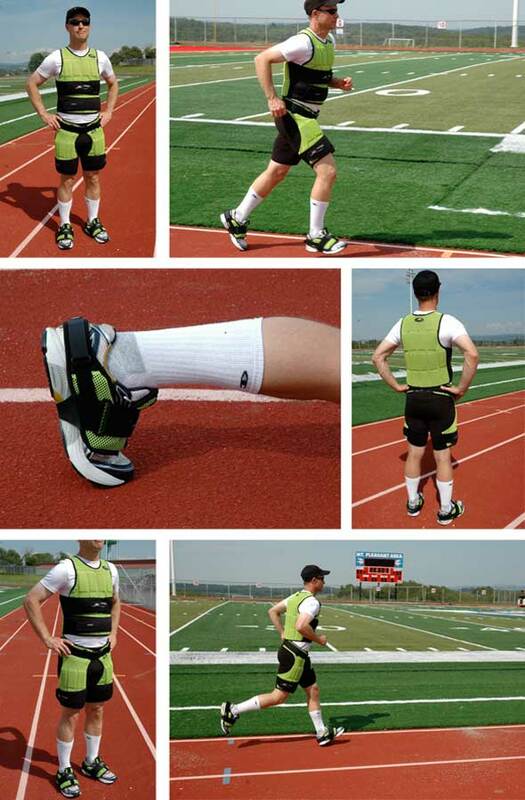 SPEED SUIT™ (long) Complete is the ultimate advanced complete athletic training system for field and court sports. Run even faster, jump even higher, and play even longer. SPEED SUIT™ (long) Complete is adjustable and comes complete with 29 pounds of weighted gear to take you to the next performance level. SPEED SUIT™ (long) Complete combines IRONWEAR’s soft Flex-metal™ weights with a wide array of high performance features unmatched by any other weighted system. SPEED SUIT™ (long) Complete is extremely thin and flexible and can be worn on top or under your clothing or sweats. SPEED SUIT™ (long) Complete allows you to evenly distribute weight over your entire body without interfering with your movements. SPEED SUIT™ (long) Complete stays in place even during intense exercise. SPEED-SUIT™ (long) Complete individual stretch weight pockets have been specially designed to hold just one weight per pocket to prevent any movement of the weights. SPEED-SUIT™ (long) Complete gives you the best fitting and most comfortable weighted suit available. SPEED-SUIT™ (long) Complete has a proprietary oversized stretch strapping system with double locking belts that holds the suit securely to most individuals weighing from 80 to over 300 pounds. SPEED-SUIT™ (long) Complete incorporates a bright high visibility neon green mesh for maximum road safety. SPEED SUIT™ (long) Complete’s air flow design helps keep you cooler so you can workout harder. 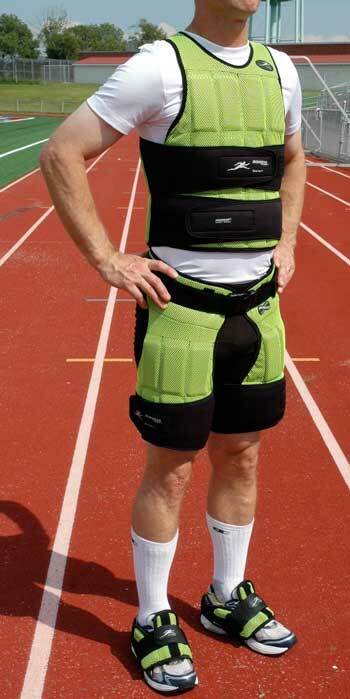 SPEED SUIT™ (long) Complete’s open belt section design provides unhindered torso rotation and bending potential. SPEED-SUIT™ (long) Complete provides an exact balance of weight from the front to the back of the suit. SPEED-SUIT™ (long) Complete soft Flex-metal™ weights bend and flex with your movements. SPEED-SUIT™ (long) Complete is easy to clean. Hose it off, hand wash or machine wash with the weights removed. SPEED-SUIT™ (long) Complete porous design keeps water from collecting and permits the vest to dry quickly. SPEED SUIT™ (long) Complete includes the 1 to 17 pound adjustable Long SPEED-VEST™ IRONWEAR’s™ top of the line weighted athletic vest designed for running, jumping and intense training. The unique thin flexible padded shoulder straps keep the SPEED-VEST™ from inhibiting your movement while the flexible design allows the vest to stay in place while still expanding to accommodate your breathing. The double set of belts fit waist and chest sizes from 24 to over a 54 inches. The SPEED-VEST™ has been awarded the “ TOP GEAR “ and is ideal for all types of training. SPEED SUIT™ (long) Complete includes the 1 to 9 pound adjustable Speed Pants™, IRONWEAR’s™ top of the line weighted athletic pants designed for building explosive legs. The unique thin flexible design contours the shape of your legs without interfering with their movement. The open center design allows air to flow between your legs to help you keep cool. Without removing the pants you can quickly adjust the tension on the thigh or release the thigh section to give your legs a rest. The proprietary belt system allow one size to properly fit waist sizes from 24 to 52 inches, and attach easily over any shorts or pants. The Speed Pants™ are an ideal tool to increase leg strength and jump height for any athlete. 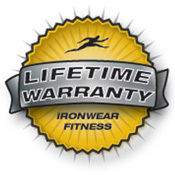 SPEED SUIT™ (long) Complete includes the ½ to 1½ pound adjustable (1 to 3 pound pair) Speed Shoe Irons™, IRONWEAR’s™ top of the line weighted athletic spats designed for improving foot speed and leg strength. The patented design attaches over any athletic shoe and locks around the heel and under the arch to prevent any movement. Unlike ankle weights, there is no jarring action because the weight and the ball of the foot impact the ground at the same time. Speed Shoe Irons™ also have an extra heel tightening strap and a extra top strap so that they can be firmly secured for running sprints. The proprietary belt system allows one size to properly fit easily on shoe sizes from a women’s 5 to a men’s 15. The Speed Shoe Irons™ are an ideal tool to improve foot work, leg strength and jump height for any athlete. SPEED-SUIT™ (long) Complete is supplied with 29 pounds of Flex-metal™ weights, but can be adjusted from about 1 pound up to 29 pounds by removing or adding the ½ pound Flex-metal™ weights. SPEED-SUIT™ (long) Complete is an ideal tool for almost any advanced track and field, basketball, soccer, football, baseball or volleyball player.